Utkarsh Rajawat,Paul-Diem and Saraniya Tharmarajah. 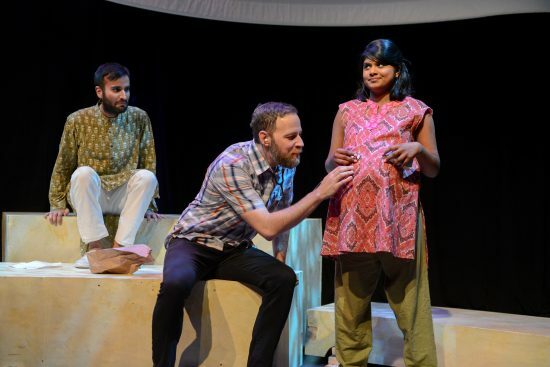 Can a play about surrogacy make you laugh? “Samsara” is hilarious and heart-wrenching. Single Carrot Theatre has pulled it off again. “My Sperm, your eggs and someone else’s uterus.” I should mention this show and review has an adult theme. “Samsara” meaning the cycle of life and death played out at Single Carrot Theatre on January 19th as the theatre celebrates its 10th year. A sonogram inside a microwave, a story about surrogacy that’s both respectful and hilarious! Written by Lauren Yee and directed by Lauren A. Saunders, “Samsara” takes us on a journey of miles and emotions. While the show highlights the ups and downs of surrogacy, it remains respectful to the challenges. On reading the synopsis of the play, I wondered if I was emotionally equipped to watch. Not that my uterus is sensitive, in fact, it’s dormant, retired actually. Yes, sadly there are no mini British Liza Minelli’s surfacing in the near future. It was just a heavy topic for a Thursday night. However, in my experience of visiting this theatre, I realized this company can make even the most traumatic of situations light-hearted and exceptionally entertaining. The theatre shares space with Parts and Labor, a modern restaurant and butchery, and the Baltimore Improv in the Remington area of Charm City. For this play, the seating was divided in the center of the space to allow for a large stage viewing area. With Bollywood style music playing as you enter, the scene is set before the lights go up. The set design is split between California and India. It’s simple yet very effective in the way it’s easily moved and redesigned during the play. The lighting plays a huge role in shifting the focus from one continent to another and splicing real life and dreams. There is a large projector above the performance area that shows various images and scenes. At various points throughout the show, the young couple who are looking for a surrogate in India makes a video of themselves to send to the prospective baby sellers. The projector is a brilliant use of technology to showcase this video and later to show a sonogram. This journey spans 8,000 miles and checks the boxes of so many emotions. Love, loss, heartache, ignorance and privilege. It reminded me of a shopping trip I took to New York many years ago. There were vendors on the streets selling fake, half price knock-off handbags, humor me here! I was touring Manhattan with city officials for a story on the homeless. They were outraged that I was considering buying one of these bags as a gift. I mean I don’t want to hand over hundreds of dollars for a designer bag in a store. I was told these bags were made in less than favorable conditions in countries like India and Pakistan, made by young kids in sweat shops. They were paid very little for their work and kept in appalling conditions. In hindsight, I didn’t realize how privileged I was and how ignorant at the same time. Those emotions are true to the story of Craig and Katie who want a baby; sadly mother nature has other ideas. Anyone who has been through the difficult times trying to conceive will appreciate the humor in the opening scenes. The couple try every sexual position possible, when that doesn’t work they go for quantity over quality. A health issue leads them to start saving for a surrogate, sadly they only save enough to be able to use a surrogate in India. Alix Fenhagen plays Katie, the frustrated young woman who wants to be a mother so badly she sends her husband on a journey to India to collect the baby. Fenhagen flip-flops through the various emotions with ease; the frustrated wanna-be mom to the excited soon to be mom. She is ignorant to the fact that what she considers to be a small amount of money she is paying for a small bundle of joy, is enough to start the surrogate on a dream career path in her native India. Fenhagen is plagued by dreams and visions. She dreams that her child will only speak Indian and will never communicate with her or see her as her birth mother. Without giving too much of the plot away, throw an over zealous and charming Frenchman into the mix of an emotional mother thousands of miles away from her husband and surrogate. Yes, it leads to an exciting, unexpected and imaginative figment of Fenhagen’s imagination. Paul Diem plays Craig. His character develops well from a hen-pecked husband to a strong man who answers to no one. Least of all his wife, who at first would not take the arduous journey to India. He develops a friendship with the surrogate Suraiya and genuinely cares for her well-being. His caring side balances out the stupid idea the couple has of women in India who make money by renting their bodies. Suraiya, the surrogate or microwave as she affectionately known by her fetus is dealing with her demons. Saraniya Tharmarajah plays Suraiya. She is calm, relaxed and focused on her studies to become a doctor, to follow in the footsteps of her mother. Tharmarajah complete with a vast (fake) stomach moves perfectly as a woman about to give birth. She holds her character throughout, and despite at times her fetus who has named himself Amit trying to persuade his mother to run away and not sell him to the American couple. Amit is played by Utkarsh Rajawat. His comedic timing is brilliant! He has an awkward aura, the way he moves, stands and communicates. Like a new born calf, trying to stand for the first time or walk. Rajawat is exceptional in this role. Despite the slight British bashing, I have to mention Dustin C.T. Morris who plays the Frenchman and doctor. I forgive you, Dustin! As the Frenchman, his outlandish, romantic, hyperactive character is somehow the perfect balance to the plot. His accent is flawless, and he pulls off the amorous character exceptionally well. As a doctor at the surrogacy clinic, his bedside manner needs a little work. For me he had one of the funniest lines in the play when he talks about moving overseas to land a job with Doctors without Borders, instead, he became a doctor without a filter. Oops! Running Time: 90 minutes no intermission. “Samsara” runs through February 12th. For ticket information, you can check out the theater’s website here. I would like to clarify that I don’t or will ever own any fake, knock-off handbags!